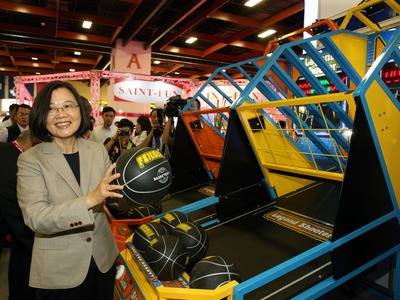 Taipei, March 20 (CNA) A YouTube video from President Tsai Ing-wen (蔡英文) celebrating Taiwanese comedian Tsai Aga (蔡阿嘎) being invited to throw the first pitch at a Taiwan-themed Major League Baseball (MLB) game in the United States, received over 220,000 hits on its first day, a spokesman at the Presidential Office said Wednesday. The video was recorded following Tsai Aga's invitation on March 19 to "Mets Taiwan Day," an annual Taiwan Heritage event, to be celebrated at an MLB game between the New York Mets and the Philadelphia Phillies in New York on Sept. 7, said Sidney Lin (林鶴明). In the video, Tsai Ing-wen presents Tsai Aga with the Republic of China flag and asks him to take it to the baseball game where he is expected to throw the honorary first pitch. "As the leader of the country and commander in chief of the nation's tri-military forces I present this flag to Tsai Aga," Tsai Ing-wen said. As of press time, the video has been viewed 301,564 times with 21,000 likes in just 24 hours, according to YouTube statistics. Meanwhile, the public is also invited to attend the festivities to be held at Citi Field in Flushing Meadows-Corona Park in New York City on Sept. 7, according to the official website of the New York Mets.